Bartenders create complexity by using rinses and sprays in cocktails. 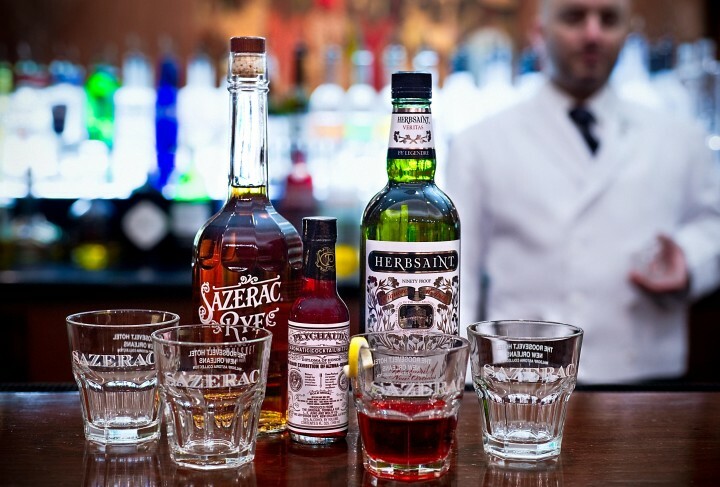 Mixologists at The Roosevelt New Orleans Hotel’s Sazerac Bar make the venue’s namesake cocktail with a rinse of Herbsaint anise liqueur—a showy technique that impresses customers. Following the philosophy that less is more, savvy bartenders are turning to spirits rinses and sprays to infuse their drinks with big aromas and flavors from just a small amount of product. Some mixologists coat the drink’s glass directly with a splash of aromatic or high-alcohol spirits, while others use a mister or atomizer to get the essence of the product. The technique is gaining favor at cocktail bars and with consumers who enjoy a sophisticated drinking experience. “A rinse imparts a small concentration of flavor from a spirit like Chartreuse or absinthe, and a spray provides an aromatic quality to enhance the nose of a drink,” explains Chris Amirault, bar manager at Harlowe, a cocktail lounge in West Hollywood, California. “Classically, you’ll see a rinse in aromatic cocktails like the Sazerac or the Dobbs Manhattan and a spray in such drinks as the Penicillin or the Corpse Reviver No. 2.” Amirault says a flamed Angostura bitters spray enhances a traditional Old Fashioned, and he uses a Laphroaig 10-year-old Scotch mist in his Poppy Don’t Preach ($14), which comprises Isle of Skye 8-year-old Scotch whisky, Cynar amaro, Grand Poppy liqueur and Martini Bianco vermouth. At The Rum Line at the Loews Miami Beach Hotel, head bartender and menu developer Robert Ferrara uses several rinses. His Cargo Ship cocktail ($15), made with Ron Zacapa 23 rum, Batavia-Arrack van Oosten, Bittermens Mole bitters and a coffee reduction, is served in a glass rinsed with Talisker Storm Scotch whisky to give it a peaty aroma. Meanwhile, the Zombie No. 305 ($18), a blend of Bacardi 8-year-old rum, Olmeca Altos Blanco Tequila, Lemon Hart 151 Demerara rum, Kronan Swedish Punsch liqueur, grenadine, lime, and a house-made mixer comprising grapefruit juice, cinnamon sticks and sugar, is served in a Pernod absinthe–rinsed glass to provide notes of anise. Product loss can be a factor in using sprays and rinses, as many bartenders throw the spirit out after rinsing it around the glass. To reduce waste, some mixologists serve the rinse back to guests in a small shot glass. Damian Windsor, the bar manager at Los Angeles bar Power House uses a Misto sprayer because it has a wide opening and provides a solid stream of liquid, unlike an atomizer. “It adds flavor in a precise manner that’s quick and cost-effective,” he says. His Algonquin cocktail ($13) features Bulleit rye, Dolin Dry vermouth, pineapple juice and gomme syrup, with a rinse of Angostura bitters and Bacardi 151 rum. At Lush Wine & Spirits, a Chicago bar and retail shop, guests enjoy watching bartenders use rinses and sprays for their cocktails ($10). “Customers love it, even if they don’t know much about the process,” says owner Mitch Einhorn. His staff uses a Kübler Absinthe Supérieure rinse for the Sazerac, a Fee Brothers Gin Barrel–Aged Orange bitters rinse for the Negroni, an Imbue Bittersweet vermouth rinse for the Martini and a Belvoir Elderflower cordial rinse for sparkling wine cocktails.